Over the next several weeks, we’ll run full updates on 2014’s House, Senate and gubernatorial races. But as an introduction we wanted to offer a little history about the ebb and flow of American politics from Ronald Reagan’s last midterm in 1986, a seemingly odd election that saw Democrats make big gains in the Senate while Republicans picked up many governor’s mansions. In the absence of major national forces that year, the map (in the case of the Senate) and incumbency or lack thereof (in the case of the governors) seemed to play outsized roles in the outcome. What might that mean for 2014? Read on. On Nov. 3, 1986 — one day before the U.S. midterm elections — a Lebanese magazine first reported on what became known as the Iran-Contra scandal. By the morning after the election, the scandal involving the sale of weapons to Iran in order to secure the release of American hostages held by Iranian terrorists in Lebanon hit newspapers in the United States. Iran-Contra did damage to President Reagan’s reputation, although from a strictly electoral standpoint, it’s hard to argue it had much of an effect: The story broke in the United States just after the 1986 midterm, and its fallout did not prevent Reagan from handing off the White House to his vice president, George H.W. Bush, in the subsequent 1988 presidential election. In fact, Reagan and his Republicans seemed to be in decent shape heading into Election Day: Reagan’s approval in the late-October Gallup Poll was a sterling 63% (it would dip more than 15 points by December, post-Iran-Contra). October unemployment, while still relatively high at 7.0%, was much lower than the dreadful 10.4% rate before Reagan’s unsuccessful 1982 midterm, and the economy was generally growing at a decent clip (first, second and third quarter gross domestic product growth was 3.9%, 1.6% and 3.9%, respectively). In the election, Americans made what, on the surface, seems to be one of the great split decisions of modern elections: Democrats gained eight net Senate seats (retaking the Upper Chamber in the process), while Republicans gained eight net governorships. The House was relatively stable, with the Democrats making a modest five-seat gain. Typically, the incumbent president’s party loses House seats, senators and governorships in midterms. In 17 post-World War II midterms, the average loss is about 27 House seats, four Senate seats and four governorships. 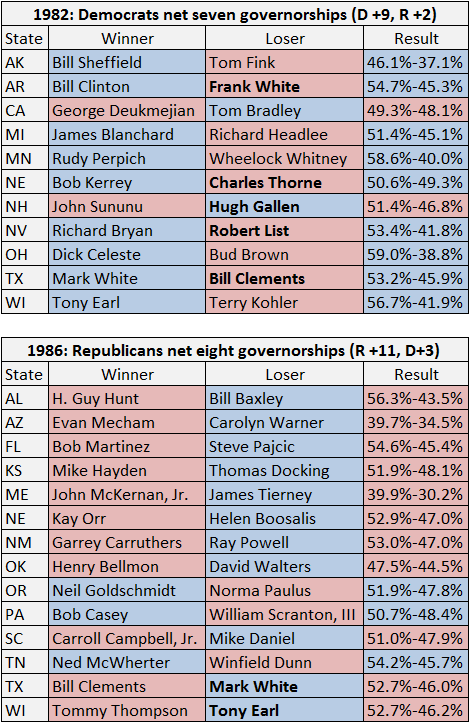 Interestingly, Reagan’s loss of eight senators was the fourth-worst Senate performance in any postwar midterm, but his addition of eight governors was by far the best gubernatorial performance of any president in a recent midterm (the only other postwar president to see his party gain governorships in a midterm was Harry Truman, whose Democrats added two in the otherwise devastating Republican wave of 1946). 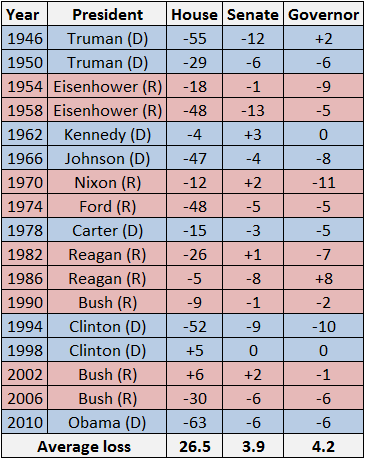 Given that 1986 was not an election defined by an unpopular president, scandal, wars or a bad economy, it could be viewed as simply a correction — that is, without major intervening factors, the big swings in the Senate and in the statehouses just represented a country reverting to the mean, particularly because the Senate and gubernatorial seats contested in 1986 were last up for election in two very different years: the Republican 1980 for the Senate seats, and the Democratic 1982 for the gubernatorial races. Reagan was elected in 1980 in the midst of Jimmy Carter’s sinking presidency, which was marked by a terrible economy — GDP contracted by a staggering -7.9% in the second quarter of 1980 — and the Iranian hostage crisis. Carter fell, and he took the Democratic Senate majority with him: Republicans netted 12 Senate seats that year, and defeated nine incumbents, including some of the Senate’s leading Democrats: Sens. Frank Church (ID), Warren Magnuson (WA), George McGovern (SD) and Gaylord Nelson (WI) were among those washed away by the Reagan Revolution. Many of the freshmen Republicans were elected from places that, back then, did not elect Republicans to the Senate. For instance, Alabama and Georgia had never elected a Republican senator, and Florida and North Carolina had elected only one apiece before 1980. Note: Names in bold were incumbents. Source: Crystal Ball research and America Votes volumes 14-17. 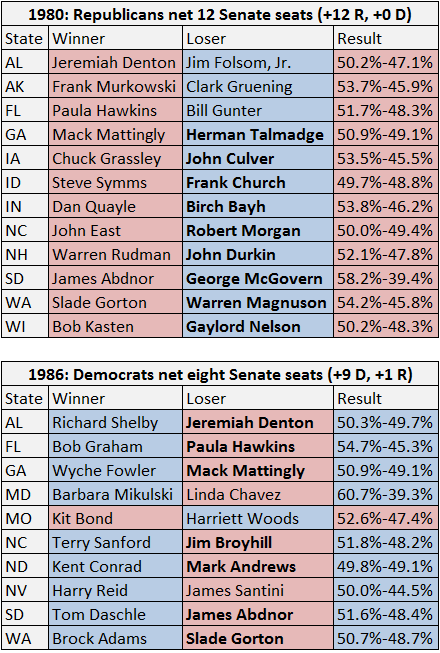 Six years later, without Reagan on the ticket, those same Senate seats were up for election, and Democrats swept all four of the southern seats that had flipped in 1980. The “Solid South” was still overwhelmingly Democratic back then in non-presidential politics, and it reasserted itself. That’s no longer the case, and a good example of this change is Alabama, which in 1986 elected Richard Shelby (D) to replace freshman Sen. Jeremiah Denton (R). Shelby remains in the Senate, but he’s now a Republican. The Democrats also won seats in the Dakotas, which despite their Republican tilt at the presidential level often send Democrats to Congress even today, as well as in Maryland and Washington, two generally Democratic states. Indeed, Sen. Charles “Mac” Mathias (R-MD) was a moderate Republican who thrived despite Maryland’s Democratic leanings; after he retired, Sen. Barbara Mikulski (D-MD) comfortably won the seat and hasn’t been threatened since. Sen. Paul Laxalt (R-NV) would have been easily reelected, but he too opted to retire, and despite Reagan campaigning twice in Nevada the week before the election imploring voters to help his party keep control of the Senate, James Santini (R) lost to now-Senate Majority Leader Harry Reid (D). Unfortunately for Democrats this cycle, their situation is at least somewhat similar to that of the Republicans in 1986. The last time this class of Senate seats was contested was 2008, which was a great Democratic year that featured a party change in the White House amid a terrible economy and an unpopular incumbent president. That’s not all that dissimilar to the circumstances of 1980. Democrats already have suffered some key retirements, like Republicans did with Laxalt and Mathias in 1986, that put some of their seats at risk: Montana, South Dakota and West Virginia in particular, with Iowa and Michigan also made more competitive because they will be open-seat contests next year. Meanwhile, a couple Democratic freshmen elected in a good environment in 2008 — Sens. Mark Begich (AK) and Kay Hagan (NC) — could be in for some trouble this time. Throw in some vulnerable veteran incumbents, such as Sens. Mark Pryor (AR) and Mary Landrieu (LA), and the stage is set for at least modest Republican gains, no matter what the overall political environment looks like. For Republicans in 1980 — who captured the Senate for the first time since 1952 — the Reagan wave put them at what proved to be an unsustainably high crest. For Democrats, 2008 helped them get to a 60-seat majority for a time between the 2008 and 2010 elections. That proved unsustainable, and so might their 55-seat majority — soon to be at least temporarily reduced to 54 after Gov. Chris Christie (R-NJ) replaces the late Sen. Frank Lautenberg (D). In other words, the story of 1986 is that the Republican Senate losses had very little to do with an overarching political environment. The Republicans just overextended themselves in a big election year, and came back to Earth in a neutral one. It’s an easy thing to imagine happening in the Senate this year. As one smart Democrat told us recently, even if President Obama is in good shape politically next year, the Democrats could still suffer a really bad Senate cycle simply because of the map. The other side of 1986’s coin was the gubernatorial campaign, where Republicans picked up eight governor’s mansions. Here, the connection to the previous election is more tenuous, but some lessons remain for 2014. Four years earlier, in 1982, Democrats netted seven governorships. Readers will recognize some of the names in Chart 3, including a certain “man from Hope” who went on to be president. Then-former Gov. Bill Clinton (D-AR) was one of the many Democrats who had a bad Election Day in 1980, but because of Arkansas’ two-year gubernatorial term back in the 1980s, Clinton came right back in the more favorable 1982 cycle to get revenge on Gov. Frank White (R). Aiding Republicans in 1986 was that many of those incumbent Democratic governors were term-limited or did not stand for reelection. Of the 11 Democratic governorships that Republicans flipped to their party in 1986, only two were held by incumbents: Govs. Mark White (D-TX) and Tony Earl (D-WI), who both were first elected in 1982 only to lose four years later. Meanwhile, Democrats won three Republican-controlled statehouses in 1986, but they didn’t beat any incumbents. Over the past half century, about four of every five incumbent governors who have run in a general election have been reelected,* so this incumbency advantage is important. Even in 2010, when Republicans netted six additional governorships, they only defeated two incumbents: Govs. Chet Culver (D-IA) and Ted Strickland (D-OH). A staggering 17** states changed the party of their governor in 2010, but the two aforementioned incumbents were the only ones to lose. This cycle, it appears that there aren’t going to be that many open gubernatorial races. At this point, all nine first-term Republican incumbents who hold governorships in states President Obama won in 2008 and 2012 look like they’re running again: Rick Scott (FL), Terry Branstad (IA), Paul LePage (ME), Rick Snyder (MI), Brian Sandoval (NV), Susana Martinez (NM), John Kasich (OH), Tom Corbett (PA) and Scott Walker (WI). (Perhaps Branstad will retire, but probably not.) So far, only five of the 36 gubernatorial races coming up in 2014 will be open seats: Arizona and Nebraska on the Republican side, and Arkansas, Maryland and Massachusetts on the Democratic. While Republicans hold an outsized number of governorships — 30 of 50 — the fact that they are likely to have incumbents running in so many places (particularly in states that lean Democratic at the presidential level) might insulate them from losses, although there are a number of Republican incumbents — Scott, LePage, Snyder and Corbett stick out — who could lose as incumbents anyway. There are many things we do not yet know about the midterm election: The state of the economy and President Obama’s approval rating a year from now are both mysteries. What we do know, though, is the history — both of American midterms in general and of the Senate and gubernatorial seats being contested this cycle. A simple reading shows that Republicans could benefit from a course correction in the Senate, much like Democrats did in 1986. And while Republicans would seem to be overextended on the gubernatorial map, the power of incumbency could protect them, which Democrats lacked in many key races in 1986. Then again, maybe a scandal or some other circumstance — one already reported or not — could change everything. Or, like in the case of Iran-Contra, happen too late to matter. *Figure is from Crystal Ball calculations using Vital Statistics on American Politics 2011-2012. This total does not include the handful of states that elect their governors in odd-numbered years. **Does not include Florida. Republican Gov. Charlie Crist ran for the Senate as an independent, and Republican Rick Scott won the governor’s race. The total does include Rhode Island, where then-independent (now Democrat) Lincoln Chafee took the governorship after Don Carcieri, a Republican, was prevented by term limits from running again.